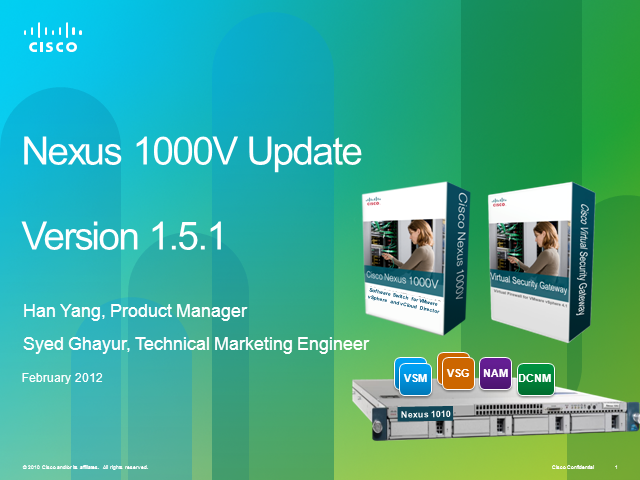 You will learn about the latest new technical features and benefits of the just released Nexus 1000V v1.5. How to easily interpret the value of billions of connected things which are creating zettabytes of data. We often speak of "the" Internet of Things, as if there is only one. But, really, every organization is unique, and every organization, including yours, has its very own Internet of Things. Your organization’s Internet of Things will spin out data from a large variety of sources, with some recently converted from analog to digital outputs. Layer upon the need to perform analytics to make sense of the data, and now you have a new challenge for IT and Line-of-Business operations. What are you going to do? This session will highlight the road map for IoT during the next 12 to 24 months, identifying which applications will be popular, and what it will mean to manage their business outcomes. Multisite organizations are reducing the number of servers in their branch offices by moving applications and server capacity to the data center. Yet, they continue to place a few essential applications locally because of performance and availability issues. Deploying Cisco UCS E-Series servers with VMware vSphere HA/FT feature along with StorMagic SvSAN virtual storage simplifies branch office infrastructure with central management & control while maintaining optimal application experience and availability for branch office users. Cisco and VMware are working together to support the implementation of simplified data center. Integrated Management solutions for the virtualized data center are critical to the success of driving operational simplifcation. Webcast Description: Webcast Description: Learn how Prime Network Services Controller, which runs on the VMware vSphere hypervisor, enables hybrid clouds and network security. Learn about the Cisco Nexus 1000V InterCloud architecture, in which Prime NSC enables security for vPath to migrate workloads to public cloud providers, and how Nexus 1000V, VSG, ASA 1000V work together to control network security. Join us to learn about the complementary nature of UCS's unified physical infrastructure and VMware's virtual infrastructure. Roger will discuss current and future integrations between UCS and VMware's management stack, including monitoring, orchestration, and provisioning integrations. We will also review some of the integrations that were presented at VMworld 2013. As enterprises gain experience with VDI deployed in their core enterprise locations, introduction of VDI into their branch office locations seems to be the next logical step. These locations do not have on-site support personnel making it difficult to update PC’s and troubleshoot problems. In this session will demonstrate how customers can achieve operational consistency between branch and data center application deployment while still maintaining high availability and optimal application experience for users in the branch office. Organizations are facing a wave of IT challenges such as increasing budget pressures, operational and physical constraints, and data security. Business leaders are looking for new ways to improve their ability to compete while moving into the virtual world of computing. During this session you will learn about the Cisco EMC Solution for VMware View on VSPEX. Topics discussed will be; Automated Desktop Provisioning, Streamlined Application Management, Advanced Virtual Desktop Image Management, and Automated Desktop Operations Management. Cisco EMC VSPEX is a simple, efficient, and flexible solution to today’s IT challenge for shared infrastructures. The very first Nexus 1000V prototype supported open source hypervisors. However, Nexus 1000V supporting VMware vSphere came to market first. Come join this session to find out how Nexus 1000V has gone back to the future in supporting open source hypervisors with OpenStack as the primary management tool. In addition, come find out how Cisco is making VXLAN even easier to deploy without the need for IP multicast in the underlying physical network. Learn how Cisco and VMware can jointly help you deliver a simple cost-effective VDI solution and the associated value proposition! Join our speakers to gain a greater understanding of how your desktop solution can benefit from a joint Cisco and VMware solution. Multisite organizations are reducing the number of servers in their branch offices by moving applications and server capacity to the central datacenter. Yet, they continue to place a few essential applications locally because of performance, availability, or compliance requirements. By making use of x86 blade servers, these lean branch offices can lower equipment and operating costs, right-size and simplify infrastructure, and improve hardware provisioning and remote management. In this session, you will also learn how deploying vSphere in remote office and branch offices can greatly simplify operations through centralized management and control through vCenter. In addition VMware High Availability and Fault Tolerance keep business critical application “always up and running” in the branch. This session will demonstrate how customers have achieved operational consistency between branch and datacenter application deployment while still maintaining optimal application experience for users in the branch office. You will learn about the Network Analysis Module (NAM) and the Data Center Network Manager (DCNM) which can be hosted on the Nexus 1010 & 1010-X. You will learn how to access and use Cisco's CloudLab located at https://cloudlab.cisco.com. Several labs are available covering Nexus 1000V, Virtual Security Gateway (VSG), and VXLAN. You will learn about the technical features and benefits of VMware's vCloud Director and how it leverages VXLAN technology by utilizing Cisco's Nexus 1000V virtual access switch embedded in the hypervisor. You will learn about the technical architecture of Vblock and how the Nexus 1000V virtual access switch, the Virtual Security Gateway (VSG), and the Virtual Wide Area Application Services (vWAAS) enables VM networking and virtual services on the Vblock platform. You will learn about QoS frameworks to address multimedia traffic across the entire data center including at the hypervisor level utilizing the Nexus 1000V. You will learn about the technical architecture of FlexPod and how the Nexus 1000V/1010 enables VM networking on this platform. Cisco’s webcasts on Digital Transformation and related topics that impact digital disruption in all types of companies.